Designed by Michael Graves in 1985, the kettle with the bird-shaped whistle became one of the icons of 20th century design. 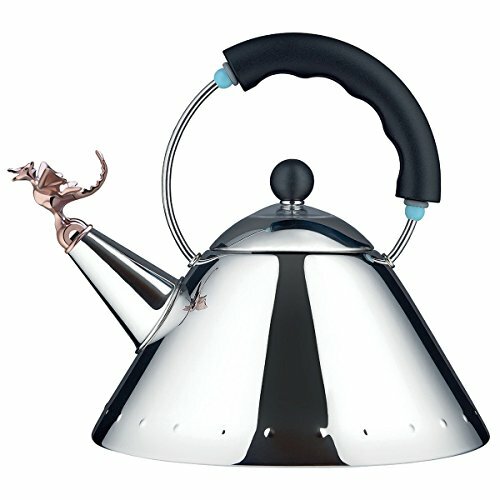 To mark the 30th anniversary of this famous kettle, Graves redesigns the whistle, turning the little bird into a charming supernatural reptile, a prehistoric, mythological and futuristic creature all at the same time: Tea Rex. The choice of the dragon is a reference on the part of the designer to the Chinese culture for whom these beings symbolize strength and fortune. The wording Tea Rex 9093 30th anniversary is stamped on the lid of the kettle.